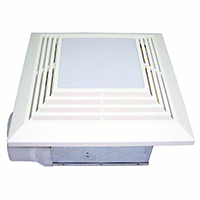 The 90 CFM USI Combination Fan/Light Bath exhaust fan is designed in a decorative style to match any decor. The motor is custom-designed for use in bathroom fans, covering as much as 110 square feet of living space, providing powerful ventilation. It is equipped with a 26W fluorescent light that can operate while the fan is in use, or independently. It provides these benefits while working to pull moisture out of the air. This exhaust fan runs at 2 sones. The motor has been permanently lubricated, and is designed to work without getting louder over time. The housing on the fan is made of galvanized steel to withstand changes in temperature as well as humidity. It comes with a 4-inch duct adapter and built-in damper to block back drafts and reduce noise. This exhaust fan allows the bathroom to maintain normal levels of humidity and keep odors, mildew, and mold from entering the space. The blower bracket makes installation simple with the keyhole slots.